If you truly want to know more about computers, you owe it to yourself to learn your computer&apos;s love language!Perhaps no other topic is ignored in the computer world today than the computer&apos;s real and internal language - that is the language of bits and bytes. With visual programming... read more systems and advanced languages putting huge buffers between users, programmers, and the computer itself, all understanding of what the computer is actually doing goes out the window (...or perhaps we should say out the Windows! ).•The simplest way to learn about bits, bytes, and binary is right here! Click to get this book because nothing on the entire planet makes it easier!•You don&apos;t have to be a Vulcan math wizard to master binary numbers! Quite the opposite! If you can count to 1 starting at 0, you can easily learn everything there is to know about binary and hexadecimal numbers!•You can never truly master C++, C#, Java, or any of the modern C-based programming languages without knowing what happens "under the hood" inside your computer!•Want to be a programmer? Want to be a better programmer? Want to make more money by sky-rocketing your skill set above others who want to shortcut their skills? Perhaps you&apos;re just curious as to what this binary stuff ids all about? 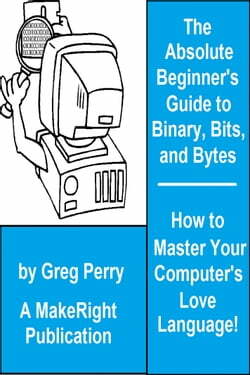 Click to get this book and see how simple bits, bytes, binary, and even a little something called hexadecimal can be!If you&apos;re a programmer or want to be one, nothing increases your understanding and skills more than knowing your computer&apos;s internals! Knowing what happens inside your machine is your number one key to being a better programmer who actually understands programming!•Did you know that your computer is not even physically capable of subtracting one number from another? All your computer can do is add! (But it does this really fast! )•Did you know that when a computer is said to have 4 gigabytes of memory, it does not actually have 4 gigabytes of memory? (It has more and you should know why! )•Did you know that your computer cannot even manipulate text? The only thing your computer can do is work with 1&apos;s and 0&apos;s! (It takes a lot of work to make people think computers handle text as easily as they seem to do! )Written by one of the most prolific and leading technical writers of the past 3 decades, a multi-million computer-bookselling author, this material is needed now more than ever and you have the chance here to get this vital material for the first time in book form ever.Click to get this book and boost your technical skills in the fastest way possible! More than just a book, this is like a complete mini-course with a patient instructor looking over your shoulder showing you how simple your computer actually is at its most lowest levels!